The Society’s next meeting takes place on Thursday 13th March 2008 at 7:30pm in St. Andrew’s Church, Bilston Street, Sedgley. The speaker is Dorothy Inett who has a long standing interest in All Saints Church and the old parish of Sedgley. She will be talking about a parish record compiled by the Rev. Charles Girdlestone* in the 1830s. The book is a remarkable account of the residents at that time and church business meetings. It is a treasure trove for family historians and predates the benchmark 1841 census. Although Dorothy has made a careful transcription of Liber Parochialis, available at Dudley Archives, here is an opportunity to hear at first hand the full story of the vicar’s book. * Vicar of All Saints Church in Sedgley from 1826 to 1837. This decorated doorway frames the entrance to one of the Manor’s most important buildings. Location, past owners and history made up the challenge. Currently this is the entrance to the Park Hall Hotel situated on Park Drive in the Goldthorn Park estate, now in Wolverhampton, but in Sedgley until 1966. Originally known as Sedgley Park it was the mansion probably built by the Parkes family around 1705. A grandson of Anne Parkes of Willingsworth, John Ward, titled later as Baron Ward and then the 6th Lord Ward, moved from here to Himley Hall in the 1740s/1750s. The buildings were let from 1763 to the Catholic Church and used as a boys school [Sedgley Park] until the 1870s. 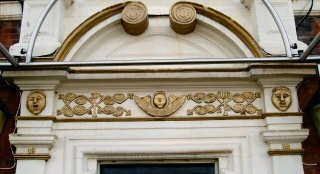 The motif could be associated with John Kemble who attended the school and became a celebrated Georgian actor. Its provenance is uncertain.